4th of July week I took a one week blogging break so I could spend five days with my children in Illinois. I thought I would do a Lifestyle Post highlighting what we did every day. 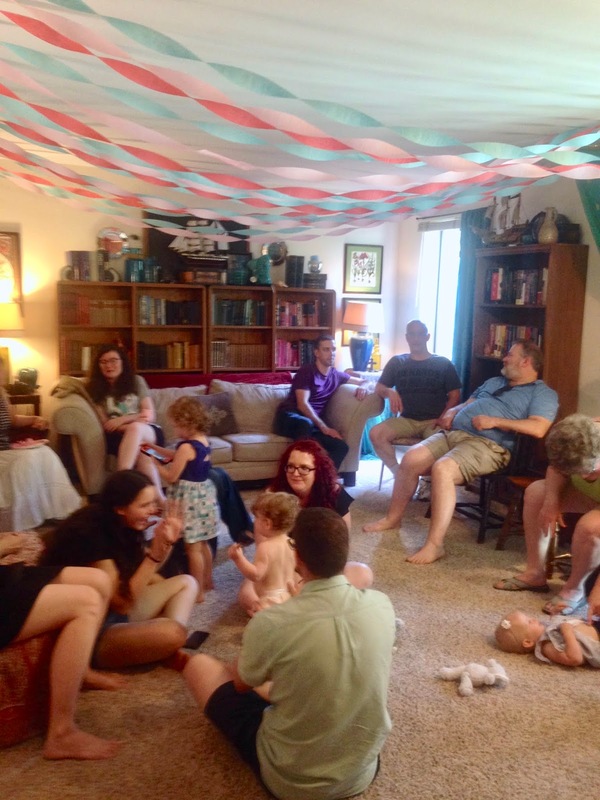 The main reason we went down to Illinois was to celebrate my granddaughter's Alethea's 1st Birthday. I did a huge post on Tuesday showing pictures of all the decorations of the party. The entire week we were in Illinois it was hot, hot, hot. In fact, they even had an"Excessive Heat Warning" in Illinois. Alethea's party was suppose to be outside, but we had to move it indoors because of the heat. Somehow 20 people managed to squeeze into Ashley and Jason's small apartment. Alethea seemed to really enjoy being the center of attention. She loved showing me all the party decorations. She enjoyed opening and playing with all of her presents. The next day we went to church and then to Starved Rock State Park. I've been wanting to go to the park for years, for I heard it's Illinois best state park. It was still very, very hot, which made the experience not as fun as it could have been, but we still enjoyed ourselves. It was so hot that my husband did not even want to carry the DSLR camera, so the only pictures I have are with my IPhone. There are so many steps in Starved Rock that you can not use a stroller on the trails, so Jason carried Alethea in a front pack. 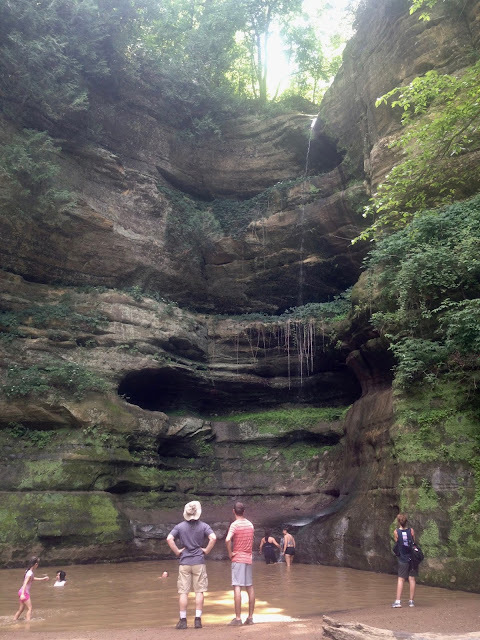 Starved Rock State Park was so beautiful, it was hard to believe it was in Illinois and not in Wisconsin. Haha! Everyone says that about this park. It looks like a Wisconsin State Park, with gorgeous river views, green trees, and actually some height to the landscape. Then my daughter and her husband with their baby. One of the most surprising thing about this park is that they have pelicans! We had never seen pelicans in any area that was not by an ocean before. It was so beautiful to see them in flight and grouped together like they are below. This park is very well maintained; which surprised me as they do not charge an admission like they do for Wisconsin State Parks. We loved all the wooden paths and overlooks. We had heard there were waterfalls in this park and my son was bound to find one. However, we were getting so hot from walking and the baby started to fuss. Ashley and Jason decided to turn back and get in some air conditioning. My son wanted to keep going, so even though I was hot, exhausted, and ran out of water in my water bottle, I relented. I am so glad I did because only a 100 feet more we found this! The "waterfall" was reduced to a trickle this time of year, but Jordan said it still hurt to stand directly under it. I was nervous about climbing the wet rock, but I did venture into the muddy waters to cool off from the heat. It felt so refreshing! We were so disappointed Ashley and Jason turned back before discovering this magical place. They would have loved it! They were unhappy about it too when they saw the pictures. Ashley said "WHY didn't you run after us?" I replied, "I was so exhausted at that point I was couldn't. I wish now I would have sent Jordan back for you." We were blessed to see not one, but two groundhogs on our hike. This one posed nicely for a picture. 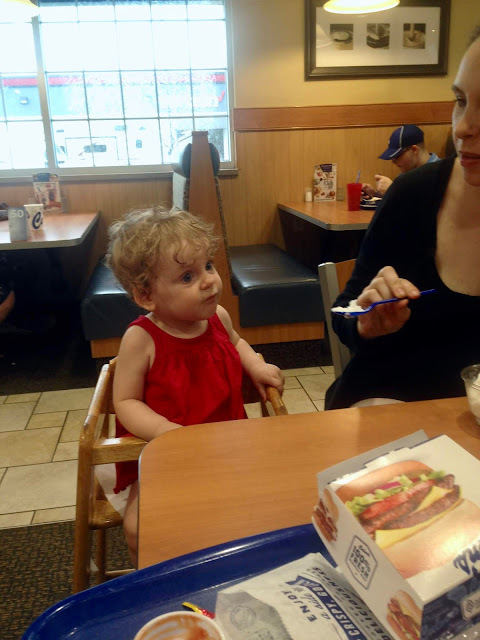 After our long hike in the heat we all needed a cool pick-me-up, so we headed to Culver's for Ice Cream! Ashley and I had their Lemon Ice and Ashley decided to give a bite to Alethea. I was ready for her lips to pucker from the sour taste, but she loved it! She surprised me and opened her mouth for more! The next weekend, we went out to breakfast at my favorite restaurant in the area: Buttermilk! This time we tried the Naperville location instead of Geneva as it much closer. It was so good! My husband love it...which is a huge compliment coming from him as he is picky about restaurants. And I was happy because I got to try their omelettes and pancakes! The last time I was there I had their crepes, and I couldn't wait to get back and try something else. Jason tried one of their skillets. I love how it's served right in the pan. Ashley and I each had the same omelet: "The Frenchie". It had wild mushrooms, caramelized onions, smoked bacon, and brie cheese. It was so good! And so huge. I actually cut mine in half so my hubby could have a taste and then I took a 1/4 of his pancakes so I could try them! And these were my husband's pancakes: "Lemon Blueberry", a full stack. He could not finish them all, even after I took a quarter. They were delicious. They had a lemon-infused batter and just look at that blueberry sauce! Yum. I'm drooling just looking at these pictures and remembering this breakfast. After breakfast, we headed over to Centennial Beach, in Centennial Park, Naperville. This is such a unique and fun "pool". They call it a "beach" but it's not a lake, ocean, or pond. It's actually an old quarry that now looks like a swimming pool, but it has sand and a lawn..hence "beach". You really have to see it to understand it. Alethea had been to an apartment pool before, but not a "beach", so she had the time of her life. She loved the sand, but we had a hard time getting her to understand that her shovel was not a spoon for eating sand. haha! The pool is HUGE! Even though it was super crowded on a hot day, it didn't feel like it because it's so large. There is a large area for families/small children, a slide, an area for swimming laps, a diving board, and two floating islands the teenagers liked to hang out on. There are also free chairs and umbrellas, and a restaurant. You can also bring your own food in! The water is not heated, but it was so warm because of the hot weather Illinois had been having. It felt like bath water. Alethea loved going into the deeper water in the family section. She was not afraid at all. She even laid on my husband's back while he swam around. She was so brave. Isn't she just the cutest? You can tell how happy she was this day. I gave her the bathing suit and cover up as one of her birthday gifts and the hat was a gift from a friend. We were thrilled that the hat matched her new suit so well. Grandpa Todd carrying Alethea. Everyone took turns watching her and playing with her so that everyone had time to swim in deeper water too. She just wanted to take those little legs and wander everywhere! We had to keep a close eye on her. And she never let her shovel out of her grasp the entire time! The next morning we were off to breakfast again. This time I took my husband to the "Egg'lectic Cafe" in downtown Wheaton. I had been here many times before, but it was new to my husband. He absolutely loved it and he could not believe I never brought him here before. I ordered a Mediterran Omelette and he ordered a skillet. Both were amazing! I think I found a new place for hubby to enjoy when we visit Wheaton. It was another scorching hot day, so we went to a splash pad in Lisle, Illinois called "Dragonfly Landing". Ashley had taken Alethea here before and wanted to show us. The water was icy cold, so you don't want to get soaking wet...but a mist or partially wet on a hot day feels wonderful. Here's Alethea again, still holding on to her shovel and pail. My daughter said that her and Jason went back to Centennial Beach the next weekend, and Alethea hung on to her pail and shovel the entire time she was there. She is so funny. The park has a little playground and a beautiful pond with fountains and a walking path as well. That day was July 3rd, and Wheaton had their fireworks that night. So we headed home for lunch and a nap, then we went to a friend's 4th of July party. After the party, we all walked over to to see the fireworks. We were all anxious to see how Alethea would react to fireworks. Would she love them or be afraid of them? We kinda thought she would love them, as she is a brave, inquisitive little girl. But, you never know how a baby will react to fireworks, do you? Here she is in her stroller patiently waiting for the fireworks to start. And here she is after....she LOVED them! I missed about half the fireworks because I was too busy watching her reaction to them and taking pictures with my IPhone. haha! This is my favorite photo of the evening. That expression says it all! The next morning was the 4th of July parade. It was very crowded, and even though we arrived an hour early, this was the best seat we could get. A friend told us that people "saved" spots as early as three days ahead of the parade by putting their lawn chairs on the curb. I was surprised the city of Wheaton would allow that. But it didn't matter that we had to sit so far back because the parade was not very good and we ended up leaving early. They had long spaces of time in-between floats/parade participants when there was nothing to see and we were just waiting. Most of the participants were politicians or businesses that did not have a float but were just carrying a sign or driving a vehicle. It was very boring. Then, we saw one float that we really objected to, so we just decided to give it up and leave, along with about ten other families. We were very disappointed in Wheaton's 4th of July parade. We had seen their Memorial Day Parade two years earlier and loved it. We thought their 4th of July parade would be better, but it was not. There were however a few things about the parade that we liked, like this large American flag being carried. I also thought the Republican Party float was great because at least they had this large elephant for the kids to see. Alethea held up well, the elephant definitely caught her interest. But she was ready to leave after two hours. I worried that leaving early was a mistake and they saved the best for the last, but it was really hot and we were ready to get back in some air conditioning. We took Alethea home for a nap then Todd, Ashley, Jordan and I went to see the new "Incredibles" movie at the historic Tivoli Theatre in Downers Grove. It was such a great movie! I love "The Incredibles"! And the historic theatre is gorgeous and a treat in itself to see. And that ends our five day summer vacation in Illinois with our kids, for the next day we drove home. We did take Alethea for a walk in the morning so I could get a cup of coffee at Dunkin Donuts and Alethea could get some time playing in the local toddler park. So we didn't hurry off too fast! It's always hard to say "Goodbye" to her. As we were leaving, she walked over to the patio door to watch us leave. She had a big smile on her face as we waved goodbye. I said to Ashley and my husband, "The time is coming when she will scream and cry when we leave." Todd said "Yep, cause she will know what it means and how long it will be before she sees us again." I'm just grateful for any time I get to spend with her and that she seems to remember me, even after not seeing me for a few months. It won't be such as a long of a time period before I get to see her again, for she is coming to my house for almost two weeks in August!!!!!! Yay! Two weeks with my precious grand baby! I can't wait. Glad you had a fun family time! Such wonderful photos! 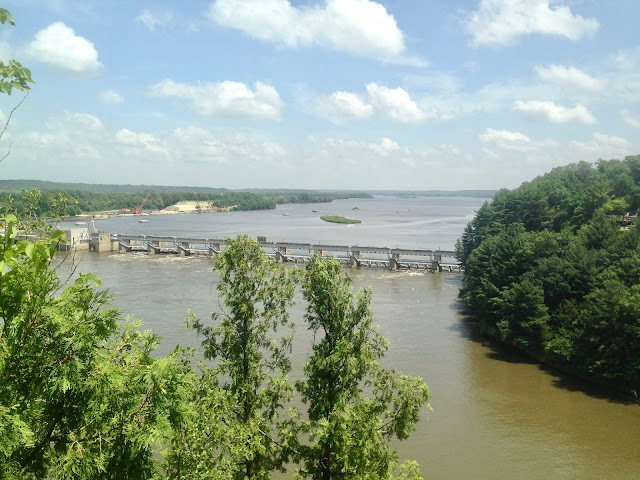 You all are very brave to visit Starved Rock in that heat! But I can understand, we love that park too and try to visit every year because it's only 2 hours away from us. Fall is our favorite time there, although I don't think we've ever seen any waterfalls in fall. Matthiesen State park is right there too, and we love that one even more because there are fewer stairs, a gorgeous bridge (where people sometimes take their wedding pictures) and fewer people. The breakfast you had looks delicious, can't believe all those berries on the pancakes! By the way, if you like to visit State Parks, check out the "Garden of Gods"/ "Shawnee National Forest" in Southern Illinois. I've only been there once in fall (many years ago!) and it was breathtaking! But it's almost at the border to Tennessee so not such a quick drive away. Thank you Ellie! We hope to go back to Starved Rock in the fall because when I saw the views I said to my husband "I bet this is breath-taking in the fall". We actually TRIED to go to Matthiesen too, but a storm rolled in so we left. We also got confused because there are two entrances: one says river and one says dells. We tried the river one first and there seemed to be nothing there. Then the storm rolled in, so we left. What part of the park do you go to? And finally, I have never heard of a "Garden of Gods" in Illinois before, but now I really want to check it out. What a nice break, Amy. We all need those as this blogging is WAY more work than any of us suspected, right? The park is beautiful and so is your family. Thanks for sharing. Thanks Darlene! It was a nice break. And yes, blogging is so much work. Sometimes I wonder why I do it, but for me it's more of a way to store my memories and engage with people of similar interests around the world. What a great photo of your little patriot in awe over the fireworks. Love her dress, too!! Your week in Illinois looks perfect, incorporating lots of water activities to keep everyone cool. Glad you walked those extra 100 feet! Wow, what a water fall. Reminds me on a grander scale of one we hike to when we are in Phoenix. So glad you had a good visit. Thanks for sharing a bit of it with us. Thanks Leslie! Isn't that a great photo? I only wish I had my DSLR instead of my phone to get a better quality photo. Yes, we were so happy we didn't turn around and miss the waterfall. What a lovely post to Rere and such lovely photos! You all had a great time! My goodness that was a week of fitting in a LOT of stuff. It looks like you all had a great time and it's nice that you got a few opportunities to cool off in the water seeing it was so hot. Love Alethea's little pink bathers with all the ruffles and it's great that she ended up enjoying her time at the beach and in the pool - if she's having fun then the whole family is having fun! Yes, we did a lot, but we rested a lot as well. My daughter was a little upset at her father because he was always napping. haha! 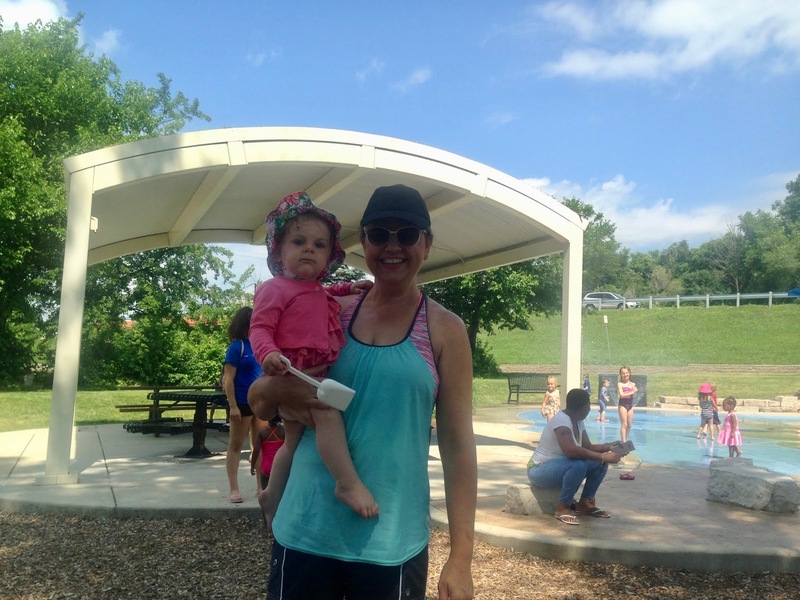 Hello Amy and thank you for sharing your Summer Break with us at #MLSTL. The waterfall is beautiful and nothing beats family time, does it?